Longtime readers will recall that the Trail Monkey, longtime running companion and carrier of good mojojojo, decided to leave me one day while running and join the carnival. I’ve been running with an EMT (emergency monkey-trail) since then, but it hasn’t been the same. He arrived a couple of days ago from Vietnam. Mo found an artist who makes the world’s tiniest sock monkeys (OK, I’m not sure if this is a verifiable record.) He’s tiny but tough, kinda like Justin Bieber, except he’s tiny but tough. The night trail races start in a couple of weeks, so this is an excellent sign. Welcome, little man. Does this artist make trail penguins? She does. You can ask for her to add a loop on top. 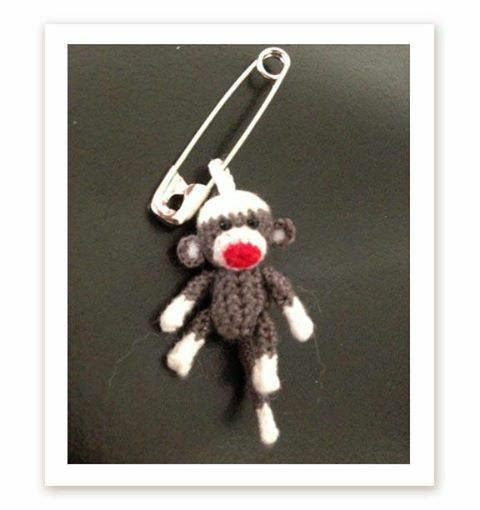 Is Tiny Trail Monkey your pin pal? I think he should be named. I vote for Gordo. What about a trail zoo? I’ve got two dogs and four cats. I’m assuming I can buy in bulk? I believe that to have effective mojo, a sock monkey must have a certain minimum critical mass. Not sure this one will make the grade. Good luck as a micro-monkey junkie!